One hour of The Cure at Roskilde 2012 will air on Belgian radio station PureFM on Sunday night (Sept. 30th) at 23:00. Songs broadcast: The End of the World, Lovesong, Push, Inbetween Days, Just Like Heaven, From the Edge of the Deep Green Sea, Trust, Want, Shake Dog Shake, The Hungry Ghost, Wrong Number. 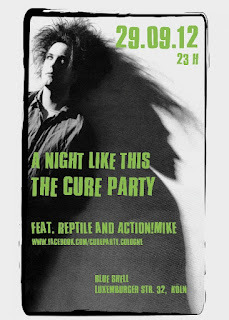 A NIGHT LIKE THIS- THE CURE PARTY! doors 23:00, entrance fee 5 euro. From Roger on Facebook: "Some news for December, yes I know its June but you have to plan ahead. Julia Kent and I will be releasing an album together called Love and Other Tragedies. It consists of our versions of classical love stories each in three movements. We will be performing the album in its entirety in London, New York and Paris in December with hopefully members from her all cello group Rasputina. We will of course film at least one of the performances... The album will be released in December at the same time as the performances in vinyl and digital download only. Update (Sept. 5th): From Roger on Facebook - "Love and Other Tragedies" is finished! I finished writing it yesterday and have sent the new pieces to Julia to record in NYC. Im just listening to the 3 tracks we have recorded already and its so so beautiful. We are talking about playing shows in December. But you'd better bring tissues hahaha its very very sad..."
Update (Sept. 28th): From Roger on Facebook - "For many reasons the release of Love and Other Tragedies has been put back until February 14th next year. Good news is Jo Quail will be playing with Julia Kent and I at the release show with two other guest cellists. There will only be one show and that will be in London at the end of February, hopefully at St Leonards.... See you there!" Maybe Tim hasn't heard that the Alamo Drafthouse Ritz has shown 'In Orange' in 35mm three times recently. And 92YTribeca has shown it at least once. No need to imagine, Tim. :) But a more widespread release would be very welcome! As would a Blu-ray release. No idea yet if this is an original song or not, but just guessing it will be a cover of the old Frank Sinatra classic. At least I'm hoping it is, as I'd love to hear Robert's take on it. Much like his cover of 'Very Good Advice' on Tim's 'Almost Alice', this could be great fun! See the glow in the dark album cover at Rolling Stone. Update (Sept. 25th): Now available in the US at Amazon and iTunes. Also, Amazon will have an exclusive vinyl version of the album, and that will be out on Oct. 30th. The Cure's Facebook has been updated with news of today's release, yet once again, no mention of it on http://thecure.com . Somebody save the official site! Anyone need The Word in Toronto?